Lucy Acosta's mother died when she was three. Growing up in a Victorian mansion in the middle of the woods with her cold, distant father, she explored the dark hallways of the estate with her cousin, Margaret. They're inseparable—a family. When her aunt Penelope, the only mother she's ever known, tragically disappears while walking in the woods surrounding their estate, Lucy finds herself devastated and alone. Margaret has been spending a lot of time in the attic. She claims she can hear her dead mother's voice whispering from the walls. Emotionally shut out by her father, Lucy watches helplessly as her cousin's sanity slowly unravels. But when she begins hearing voices herself, Lucy finds herself confronting an ancient and deadly legacy that has marked the women in her family for generations. 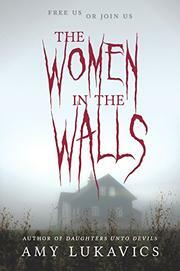 A girl becomes certain that the ghosts of her mother and other female relatives inhabit the walls of her family mansion. Lucy Acosta loves her aunt Penelope and her best friend, Penelope’s daughter and her cousin Margaret. One evening Penelope simply walks into the woods and disappears. Margaret believes she hears her mother’s voice coming from the walls, especially in the attic. Investigating, Lucy finds signs that Penelope may have been practicing witchcraft. When another disappearance occurs, Lucy herself begins to hear the voices. Meanwhile, Lucy’s father remains cold and distant, and the family continues to host lavish dinners for the country club that appears somehow to be tied into the family fortune. This rests so strongly on the female family members that Lucy’s father changed his own name to Acosta when he married Lucy’s mother. (Aside from the Latino name, there is no evidence that this family is other than rich and white.) Lucy herself can make no claim to being normal; she finds relief from stress by cutting herself with razors she keeps in an elaborately decorated box. Writing in Lucy’s voice, Lukavics drives the story through sudden hyperbolic statements rather than by building suspense, and the gothic horror, complete with some extremely gruesome scenes, often feels improvised. Eventually readers will find a resolution appropriate to the horror genre.